The Wartburg Science Symposium is a one-day workshop designed to give science- and math-oriented high school juniors and seniors an opportunity to pursue, in depth, specific areas in contemporary science, engineering, and psychology. Each workshop, led by Wartburg College faculty or a team of clinical laboratory scientists from ASCLS-IA, consists of six to 12 students and the instructor. The structure is informal and encourages close interpersonal contacts. Each student participates in only one workshop. Through interacting with other students and professors, students are exposed to the activities of other members of the symposium. Student participants are encouraged to share their experiences and newly gained knowledge with their high school teachers and students after the symposium, and should feel free to interact further with professors and other symposium student participants. Some high school seniors may qualify to participate in a Knights Priority Scholarship Day, one of which is being held the day after the symposium. Honor Scholarships: Up to $1,500 per year! Participation in the Symposium, including a writing sample. Applicants will be notified of the award within six weeks following the Symposium. Students interested in careers in health professions, science, mathematics, computer science, engineering, and psychology are encouraged to apply. Wartburg College will award Science Symposium Honor Scholarships up to $1,500 per year for a total up to $6,000 while the recipient is enrolled at Wartburg. The Honor Scholarship students must take one introductory science/math course during the first year, and a grade point average of 3.00 is required for renewal of all honor scholarships at Wartburg College. Math and Science Education – SCIENCE OF THE EGG: (Dr. Michael Bechtel) Iowa is known for two interwoven industries that support the nation and the world: agriculture and food. Students will study facets of the poultry industry from egg through hatching to processing. They will work with eggs, newly hatched chicks, and adult poultry (Gallus gallus domesticus). This workshop will provide an overview of interconnected themes dealing with genetics, chemistry, physics, zoology, public health, and economics. Psychology – THE MAGNIFICENT (AND FLAWED) NATURE OF HUMAN THOUGHT PROCESSES: EXPLORATIONS IN SOCIAL AND DEVELOPMENTAL PSYCHOLOGY (Dr. Cynthia Bane and Dr. Shaheen Munir) Psychology explores the connection between human behavior and mental processes. Activities and discussions will show students how to recognize and avoid biased thinking. 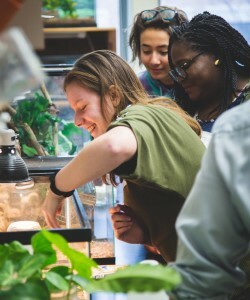 Through interactive demonstrations, students will also learn theories of child development and connect them to their own lives. Engineering Science – HOW ENGINEERS HELP THE WORLD: SC 243, 245 (Dr. LeAnn Faidley) Engineers put knowledge of math and science to use in the creation of products and processes that solve the world’s problems. In this workshop, students will learn about a variety of engineering disciplines as they work with a team to design devices to perform specific tasks. Mathematics – MATHEMATICAL MODELING AND MUSING: SC 247, 249 (Dr. Mariah Birgen) Mathematical Musing is all about the cool things in math that you never get to see in school. Depending on interests, we may figure out that there are different sizes of infinity, or that there are mathematical worlds where A*B does not equal B*A. Mathematical Modeling is about using everything you know about math to figure out how the world works. Depending on interests, we may figure out how drugs break down in the human body, how diseases spread in populations, or how much improvement a rocket can gain by adding another engine stage. This workshop will use computers to numerically solve things that not even your calculus teacher can solve by hand. Everyone had an outstanding time at the Citywide Spring picnic…until later that evening. People began to get sick and were seeking treatment at the local hospital. City officials were alarmed by the rapid onset of this mysterious illness that seem to be associated with the picnic; they promised a full investigation and have selected you to be part of a team of epidemiologists to determine the source of this outbreak. Students will apply their newly acquired knowledge of epidemiology, infectious diseases, and food safety to identify the agent responsible for this mysterious illness. Work quickly… Time is of the essence. Marine Biology – LIVING IN A WATERY WORLD (Dr. José Reyes-Tomassini) Marine and freshwater animals face a variety of challenges related to living in a watery world. Using dissections, lab experiments and simulations, we will explore some of the ways that animals adapt to these unique environments. We will dissect a freshwater fish and a saltwater fish and learn how the anatomy of these animals informs us about how they cope with (and often take advantage of) living underwater. Neuroscience – BRAINS AND BEHAVIOR: AN INTRODUCTION TO NEUROSCIENCE: SC 143 (Dr. Samantha Larimer Bousquet and Dr. Jay Garaycochea) The field of neuroscience asks questions at multiple levels. In this workshop students will examine brain anatomy both at the systems level (dissecting a sheep brain) and at a tissue/cellular level (staining and mounting rodent brain slices). Functions of the nervous system will be investigated using sensory demonstrations and physiological measurements in humans and behavioral experiments with mice. Clinical Lab: DIAGNOSIS: SC 126 (Theresa R. Fruehling, MA, MLS, ASCPCM) Diagnosis: What determines the difference between: heart attack vs. a gallbladder problem? Over-committed/over-worked vs. thyroid problems? Bacterial vs. viral infection? Appendicitis vs. gas? Leukemia vs. anemia? And benign vs. malignant (non-cancerous vs. cancerous)? Who finds the answers to these questions, and how do they find the answers? Join us on a quest to discover the answers and reveal a hidden world within the health-care profession. Chemistry – GOT CAFFEINE? : SC 230 (Dr. Matthew Zart) Caffeine is a stimulant and diuretic found in some plants. An alkaloid naturally found in coffee and many teas, caffeine gives many people a much-needed jump-start to the day. Participants in this workshop will isolate caffeine from tea and in the process learn about the techniques of extraction and sublimation as a means of separating and purifying organic compounds. Environmental Science – MAKING IOWA WILD AGAIN: SC 145 (Dr. David McCullough) Many people think of corn fields when they think of Iowa. But there are many natural areas that are important for conservation of our natural resources. In this workshop you will go out in the field and learn how ecologists assess natural areas for habitat value. You will then help develop a plan to manage the site for wildlife and water quality. Dress for being outdoors (warm layers, shoes you can get dirty, raincoat if needed). Genetics – THE GENETICS OF TASTE: SC 104 (Dr. Stephanie Toering Peters) Students will use molecular biology techniques to isolate their own DNA and examine a single nucleotide polymorphism (SNP) that determines their ability to taste bitter compounds. The genetic results will be compared with their tasting ability. Participants will learn about the various ways that human performance can be measured. The workshop will include active learning and hands-on equipment usage. Physics – PARTICLE COLLISIONS (Dr. Ben Bousquet and Dr. Charles Figura) Particle colliders such as the Large Hadron Collider in Europe use some very basic physics in a very complicated way to learn about the structure of the atom, its constituent particles, and the fundamental building blocks of the universe. In this workshop, we will use some macroscopic collisions to investigate the physics principles behind this probe of the subatomic world.